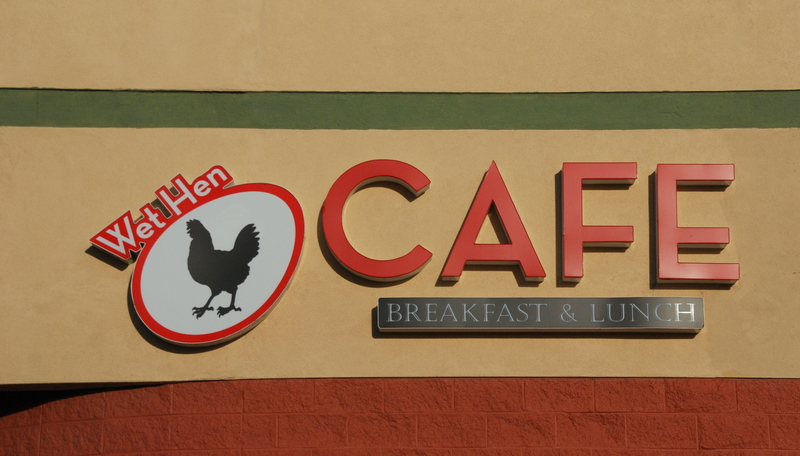 Wet Hen Cafe & Catering is a quaint cafe on a prime corner in SE Reno with an amazing view on the patio. The menu features Quiche, home made soups, fresh garden to table ingredients, a dash of pastry and muffins, fresh breads and whole roasted meats. It’s an old world cafe made local. This small menu overflows with quality ingredients in their famous quiches, all their sandwiches, soups, salads, breakfast offerings [served all day] and the combos come with a cookie. The Picasso on wheat is a favorite with smokey bacon tomato, lettuce [light on the mayo please] and as the pie’ce de re’sistance is the lovely brie they lay lightly in the middle. The Gobbler is the signature sandwich with fresh oven roasted turkey [hand pulled], cranberry sauce, lettuce and mayo. Local honey sits on the shelf along side local artists’ work on the wall that rotates on a monthly basis as a quiet corner awaits the next guest. Wet Hen offers local drips from Blind Dog Coffee Roasters and overstuffed chairs to mull over the paper with your java. For me it’s like going to moms for breakfast as it is as comfortable and at ease. The staff is friendly and always smiling however, don’t be surprised that the dishwasher/owner is the one smiling at you from behind the counter, or the bossy owner or offspring. And how could a home town place like this not have pie! Apple pie, that’s it, just apple pie. Simple and sweet.Wet Hen is a gem hidden in east Reno with something for everyone and worth finding!